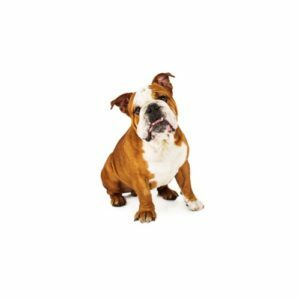 Known for their loose-jointed, shuffling gait and massive, short-faced head, the English Bulldog is known to be equable, resolute and dignified. A medium-sized dog, they are not your typical lap dog, but would like to be! They are one of the most popular breeds according to AKC Registration Statistics due to their lovable and gentle dispositions and adorable wrinkles. The English Bulldog may be brindle, white, red, fawn, fallow or piebald. Said to have originated in the British Isles, the name “bull” was applied because of the dog’s connection with bull baiting. The original bulldog had to be ferocious and courageous, and almost insensitive to pain. When dog fighting became illegal in England, fanciers set to the task of preserving the breed by eliminating the fierce characteristics. Within a few generations, the Bulldog became one of the finest physical specimens with an agreeable temperament.